Trail layout and design is the practice of combining art and science to create a route that keeps people on it, water off of it, and is harmonious with nature. This course helps you gain or brush up on the skills and techniques necessary to design trails looking at the bigger picture of connectivity, character, and positive user experience. After a sustainable design has been reached, the course participant will learn how to lay it out on the ground taking into consideration grades, soil types, points of interest, construction requirements, and water flow. 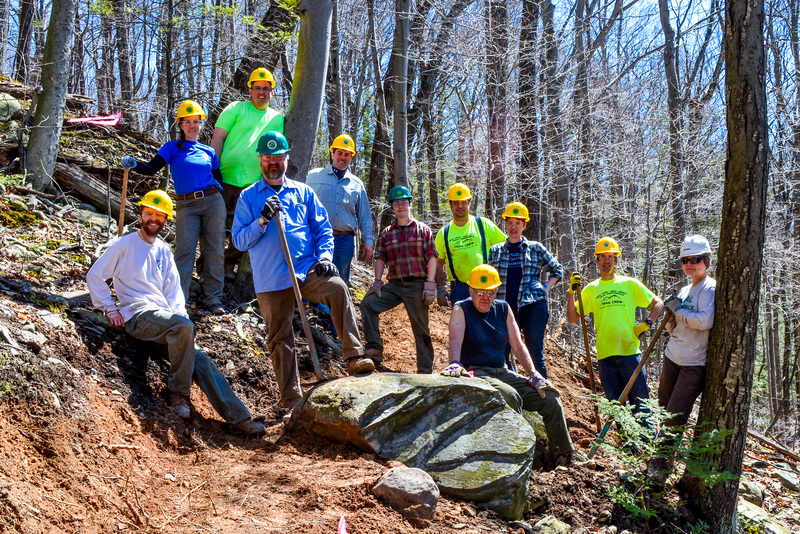 This course helps you gain or brush up on the skills to build safe, long-lasting trail structures that fit into their surroundings and provide a positive user experience. You will also learn why and where structures are applicable. Trail Supervisor Training is a tool kit of supervisor skills necessary to managing Trail Conference volunteer trail maintainers. This course helps you gain or brush up on the skills necessary to be a Trail Conference volunteer supervisor. Training will be provided through discussion, case studies, and hands-on exercises. You will learn how to develop and tap into resources that will help you handle your on/off trail responsibilities. Train the Trainer is learning new methods to engage and educate adult learners, and how to prepare for instructing a course. This course helps you gain or brush up on the skills necessary to becoming a Trail Conference instructor volunteer. You will learn how to manage course logistics and class time, integrate materials, and develop teaching aids to create a positive, engaging learning environment. You will have the opportunity to practice instruction and refine your techniques using peer evaluation and feedback. Tread and drainage is creating a pathway surface that keeps water off the trail and people on it resulting in sustainability. This course helps you gain or brush up on techniques to keep a trail from becoming a gulley. These techniques include sidehill trail construction, utilizing sustainable grades, and ways to shed water off the trail. Drainage structures such as dips, knicks, swales, and waterbars and their construction are also a focus of this topic. The online Trails Database provides for the management and administration of trails, segments, volunteer assignments, changes, new trail and segment additions. This hands-on workshop introduces the new features and walks through the process. Participants will walk away knowing how to update their trails, segments, assign Maintainers and to view their online SMS reports. Prerequisite: Website login with appropriate permissions. Participants are encouraged to bring their laptop if available. Registration and participation is limited to the role appropriate for this workshop.